This Hinkley Carson 5 light outdoor porch globe chandelier in vintage iron finish with seeded glass shades is rated IP44 and boasts an atom sphere, with a candelabra chandelier hanging inside. Featuring a circular ceiling cup and rod suspension supporting a 67cm globe constructed from overlapping metal bands finished in vintage iron. Five candle style lights feature metal fitters securing seeded glass cylinder outer shades. A unique hanging outdoor porch light that is suitable for large covered exterior areas in contemporary, period or traditional settings. This new, stylish hand-crafted collection is great for adding character to your outdoor space and features striking overlapping metal ribbons in a vintage iron finish, combined with seeded glass shades that gives an authentic look. High style heads outside with the Carson collection. 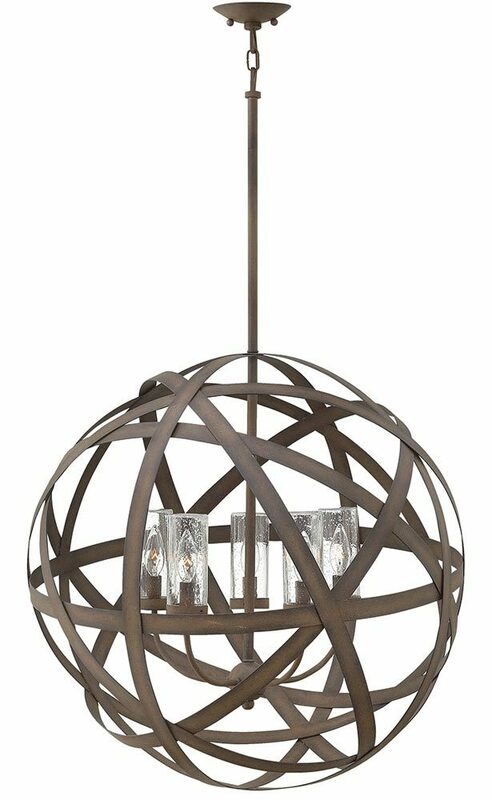 Rated IP44, this stunning transitional design will illuminate any outdoor oasis. Supplied with one 15cm and two 30cm rods that can be used individually or in any combination; please see below for exact dimensions. If you are searching for quality outdoor lighting in a unique style, the Carson suite should be considered. Fully weatherproof and supplied with a manufacturer’s 3 year anti corrosion warranty, which relates to the corrosion of finishes on exterior lights like this one. Locations within 5 miles of the coast are excluded. Exterior fittings must have an IP (Ingress Protection) rating which indicates the fittings ability to prevent solids and liquids penetrating the enclosure. The higher the number, the greater the protection. The minimum rating for an outside light exposed to the weather is IP23. This chandelier is rated IP44. There are matching fittings in the Carson outdoor range that includes smaller three-light chandelier and a wall light; please see below. This unique light is supplied by Elstead Lighting and designed in the USA by Hinkley, founded in 1922 in Cleveland, Ohio. They have transformed from a small outdoor lantern company to a global brand intent on bringing you the best in style, quality and value designs like the Carson 5 light outdoor porch globe chandelier in vintage iron finish with seeded glass shades featured here.